At Pebble Beach our goal is to provide our students with a fun and safe learning experience that will nurture the joy of riding and the bond between human and horse. Through our lesson program we hope to offer our students lifetime skills and lasting memories by developing the individual talent, desire and goals each student possesses. Below is a brief summary of our lesson program. For more information on advancement requirements from level to level, please see your instructor. Please call us at 831-624-2756 to schedule a lesson. Our office is open seven days a week between the hours of 8:30am to 5:00pm PST. Lessons are available Tuesdays thru Sundays, year-round. Remember to schedule your lesson at least one week ahead of time. During the summer or over holidays, please allow at least two to three weeks advance notice. 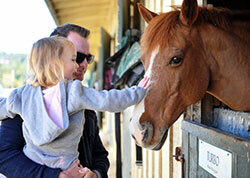 Horseback Riding with Pebble Beach Trail Rides. Ride on a private beach or through the majestic forest to some of the most breathtaking spots on earth. Offering you choices of a Group Beach Ride, Family Forest Ride, Private Beach Ride or an Extended Private Beach Ride. Rides depart year round Monday – Thursday at 10am, 12pm, 2pm & 3:30pm. Reservations at least one week ahead are recommended. When you call, we will ask for the number of people in your group, your desired ride time, the type of ride you would like to take and the ages of any kids in your party.